Hi guys. I'm back to Acknex, and facing indeed a very noobish problem. c_scan doesn't set 'you' pointer, in EVENT_SCAN for scanned entity..
Can anyone tell me, what's wrong in this code? Thank you guys. Edit: can't get ENABLE_DETECT working too.. this makes me mad. I set ENABLE_DETECT for entity that performs the c_scan, and ENABLE_SCAN for scanned entity... in the event of scanning entity, I try to make all scanned entities INVISIBLE, but just nothing happens (as if scanning doesn't find any entities with ENABLE_SCAN event set on). I think there are two possible ways, in dependence of the needed result. If you want this one entity (ent2) to hide after scaning it, you need to take the my pointer instead of the you pointer for its event. This would be the first solution. If ent1 should be able to hide all entities which will be, you have to assign the event to ent1 and enable scan for it too. Then the you pointer would work too. Hey HellThunder! Thank you for a quick help! About MY instead of YOU pointer, in the event in order to make scanned entity invisible No, that wasn't a point of my question (you probably mistaken with what I wrote about ENABLE_DETECT). I just couldn't get pointer to the scanning entity, which should be in this case YOU pointer. I was expecting (almost all events work this way) ENABLE_SCAN event to set YOU pointer automatically to the scanning entity, but in my example it didn't work and resulted in E1513. Yes, I could add if(you) check in order to avoid poping up error message But my case was - 'why doesn't ENABLE_SCAN set YOU pointer to the scanning entity?'. Your second solution is what I tried to do with ENABLE_SCAN, but why didn't it work in my example? Isn't setting ENABLE_SCAN for entity which should be scanned enough to set you pointer? I used c_scan with SCAN_LIMIT but without setting SCAN_ENTS, could that cause the problem? Edit: just noticed that you set ENABLE_SCAN for ent2 and event function for ent1.. Why? Usually when you use events, you set event and the event function which should be triggered for the same entity, right? (as for ENABLE_BLOCK, IMPACT, ENTITY, SHOOT etc). But anyway, I can't understand, why my first example doesn't work?? Edit4: seems that I got it working only cause I've put 'c_scan' into the 'hero' function.. If I assign to that entity a pointer and try to c_scan from main function, it gives E1513.. And I can't understand why. My best regards! Thank you for your time and help! The reason that your first example does not yield the desired result (set the you pointer) is that the my pointer is NULL in the main function. When you use ent1->x and ent1->pan as arguments you "lose" all context to the entity (ent1). Thank you very much for being part of this community! Is it really worth it to put the whole game loop into main? Is having separate actions/whiles that bad? Don't take example in my first post too serious, I just wanted to prototype something and faced this prob (cause I'm dumb ). 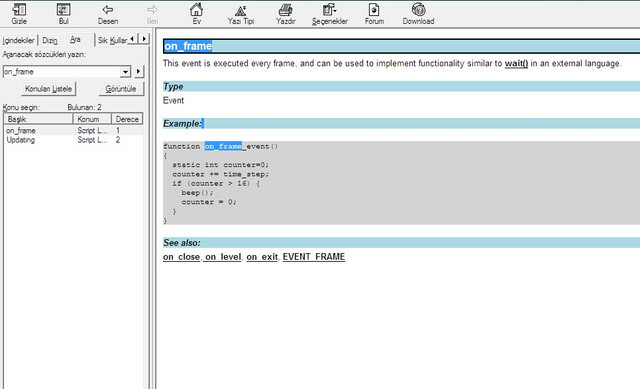 In my projects, I usually use 'event_frame' instead of while loops, for entities, props etc (thanks to MasterQ32). Then one while loop inside of player's action (player's movement, weapons etc), and one loop inside of main function for all gui, shader pipeline etc. I think it's better to avoid using loops, if possible. I remember having performance issues when I used while loop for each NPC etc. Having one game loop is the way to go IMO, so as long as your project isn't that complex already change it. This way you have complete control over what gets executed when and how. You could for example freeze all enemies or projectiles in the game with a simple if(variable) check, while allowing the player to move freely. You only have to let's say create a list of objects after level_load (on_level_load or what it's called) and free that list on or before level change. I still use wait(1) entity loops here and there but just for some level decoration/ dynamic objects which don't have an actual influence on gameplay. Superku, that's an awesome idea! Got to give it a try. Thank you very much! Edit: it's sad that you can't find anything about 'on_frame' in manual. There is a title about on_frame... but only in A7 manual i guess. That's weird.